The Vermont Bat Center was founded in October of 2015 to provide information and educational programs about bats to individuals, schools and other groups and support the rescue and rehabilitation of injured and orphaned bats from throughout Vermont. The founders, Barry and Maureen Genzlinger, have been bat advocates since the mid-1990s when Maureen noticed several cute little bat faces looking down at them from the eves above their deck one summer evening. They did a bit of research and learn how to build a bat house for their visitors. Their first bat house was fastened to the pole that held up the roof overhanging the deck. The bats quickly discovered it and moved in. They loved it and soon had several friends move in with them. Unfortunately for the humans the selection of the roof support as the location for the bat house was not such a good idea. Bat droppings were landing all over the deck! That problem was easily fixed by putting up a pole just off the edge of the deck and moving the bat house onto it one evening after the bats had left for a night of foraging. It was not long before a friend asked if they would make them a bat house. Then another friend just had to have one. Then another. Barry and Maureen wondered if they could help more people support the bats in their neighborhoods if they made lots of bat houses and sold them using a web site. In 1998 they joined the North American Bat House Research Project, had their designs certified by Bat Conservation International, started Chiroptera Cabin Company, created a web site and began selling bat house across the country. At that time there were only 4 certified bat house builders and demand turned out to be very high. Their company offered 6 different bat house styles. By 2011 they had sold over 4,000 bat houses to people across the US and even some in Canada and Mexico. The number of bat house builders with web sites had grown to over 40 so Barry and Maureen decided to close their company and focus on expanding their educational programs and rescue efforts. 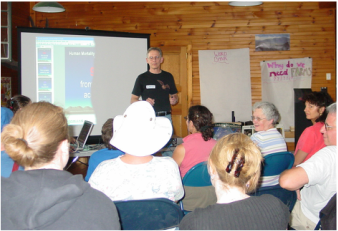 Since 2001 Barry and Maureen have been presenting educational programs to schools and community groups throughout Vermont. In 2013 Barry became a licensed bat rehabilitator for the Vermont Fish and Wildlife Department with Maureen as his assistant. They have taken in over 125 bats that were injured, orphaned, or awakened from hibernation during the winter. They have provided care for these tiny friends who would have certainly died without their help. All of the educational materials, travel expenses for programs and rescues, rehab facilities, equipment and supplies have been paid for from Barry and Maureen’s personal funds. The Vermont Bat Center was created to help provide funding to continue their vital work. Using on-site programs, social media such as our Facebook page, our web site, and links to other sources we can reach thousands of people with educational information. Thru donations we can provide the financial support needed to care for these wonderful little mammals.